This IS, hands down, the best carrot cake I have ever eaten. 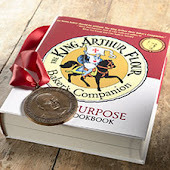 It came from King Arthur's Bakers Companion, which is a cookbook every baker must have. It is filled with flour and pastry goodness and every recipe is spot on. This IS the best carrot cake I have ever eaten. 1) Preheat the oven to 350°F. Lightly grease a 9" x 13" pan. 2) Beat the eggs, sugars, and vanilla in a large mixing bowl till smooth, about 2 minutes at medium-high speed. 3) Mix the melted butter with the oil. With the beater running, add the oil mixture in a stream, beating till smooth. 4) In a separate bowl, whisk together the flour, leaveners, salt, and spices. Add these dry ingredients to the wet ingredients, stirring to make a smooth batter. 5) Stir in the carrots, nuts, coconut, and pineapple. 6) Spoon the batter into the pan, spreading it to the edges. 7) Bake the cake for 40 to 50 minutes, until the cake is golden brown, and a cake tester inserted into the center comes out clean. 8) Remove the cake from the oven, and cool right in the pan. 9) When it's completely cool, make the frosting. 10) Combine the butter, cream cheese, vanilla, and salt in a medium-sized bowl, and beat together until light and fluffy. 11) Add the sugar gradually, beating well. 12) Add the milk a little at a time, until the frosting is a spreadable consistency. 13) Spread frosting over the cake. Garnish with minced crystallized ginger, if desired. Yield: 9" x 13" sheet cake, about 24 servings. Wow this cake is so beautiful!! My name is maria and I read your interesting blog, many compliments for the recipes!!! Kim, Loving the new blog make-over. This really does look like a tasy carrot cake. 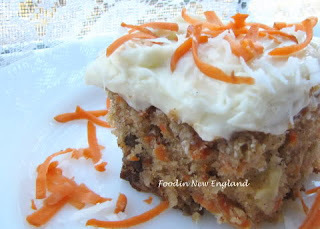 Carrot cake is an all time favorite of mine. Yours looks great. Nice to meet another New Hampshire blogger.